1. Rick Owens. He claims 'Brutalism' this season. It's earthy, it's primal, it's visceral. It's a mouthful. It's savory. I don't think I like that I love it. But I love it. Especially that veil. I found a nice short video of him explaining himself. 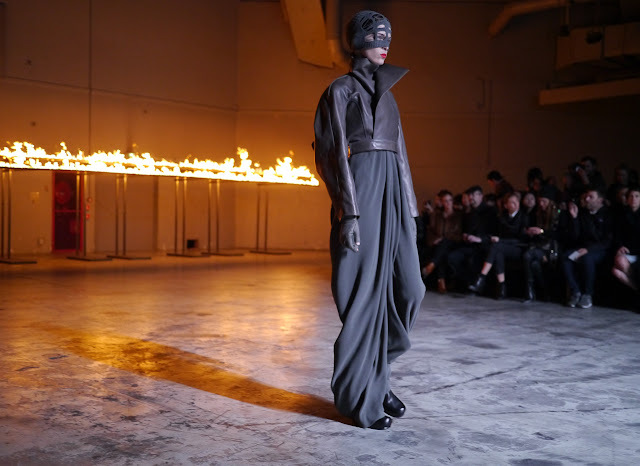 I very much enjoy-- I hope you do, too: Rick Owens! (click to see full picture) 2. Thierry Mugler. 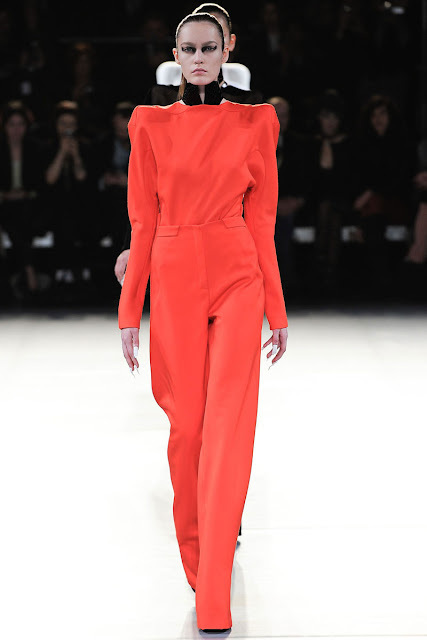 I love how dramatic Mugler is famed to be. I've always felt that the line has had a theatrical flair--Even Mugler's muse, Rick Genest (Zombie Boy), is a spectacle in himself. Nicola Formichetti has taken over for a little over a year, and the bold lines and cut outs make for a futuristic-streamlined-chic. It's bold, it's complex, it's seriously textured. Awesome. 3. Anthony Vaccarello. I hadn't heard of this designer until Jan/Feb, but his f/w collection is great. Super asymetrical, super body-con and fitted, lots of satin, emeralds, navys, etc. I would love to wear any of these pieces. Glamorous, cool, and so silky it's almost liquid. Lovely. (click to see full picture) 4. Jil Sander. Raf Simons's last show was beautiful-- stark white walls and floors plated gorgeous flowers in glass cases. It was like an art exhibit-- it was an art exhibit. Lots of pastels and bright colors, with a slightly nostalgic air to every piece-- and yet, each piece also came with its own edginess. The oversized coats gave off a sweetness that somehow reminds me of Audrey Hepburn. The dresses are all either fitted or seem to spill over the form, and it's quite beautiful. (click to see full picture) Alright. I'm done stuffing this stuff down your throats. These are just a few of my favorites. Yay pictures! Ok I'm done talking. Peace out, boy scout! Jil Sander is always so classy and elegant, love it.